AN has been anxiously awaiting official news of an architect for Los Angeles’ long-awaited Downtown Federal Courthouse, and we’ve picked up the scent of a promising rumor. 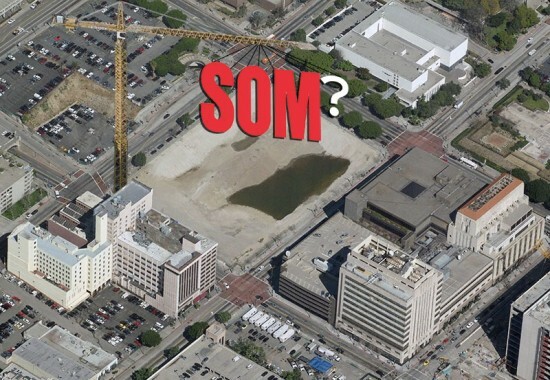 Brigham Young’s DTLA Rising blog has heard from a “source at a large architectural and design firm in Downtown LA” that SOM has won the commission, beating out a short list of teams including Yazdani Studio and Gruen Associates, Brooks + Scarpa and HMC Architects, and NBBJ Architects. The new $322 million courthouse will be located on a 3.7-acre lot in Downtown LA at 107 South Broadway and will contain 600,000 square feet incuding 24 court rooms. The General Services Administration (GSA), the federal agency in charge of building the new courthouse, hopes to have the project completed by 2016. The former art-deco courthouse at 312 North Spring Street will be sold to help pay for the new structure, drawing criticism from some politicians. The GSA is expected to make an official announcement soon, and we’ll be sure to keep you updated as news comes in.